Chocolate: this is where I have issues; I don’t really know the meaning of a little bit of chocolate chips. A recipe could call for a third of a cup, half a cup, a cup and regardless of the measurement; every recipe I make gets one bag of chocolate chips. If I don’t put them all in my baking, I will just end up eating them straight from the pantry. So, for the sake of my waistline it is much better to have a muffin bursting with chocolate chips so I can share them with others. To really amp up the chocolate flavour of these muffins, I actually made them with chocolate milk. I figured if an abundance of chocolate chips is a good thing, then adding chocolate milk into the mix could only make these muffins better. 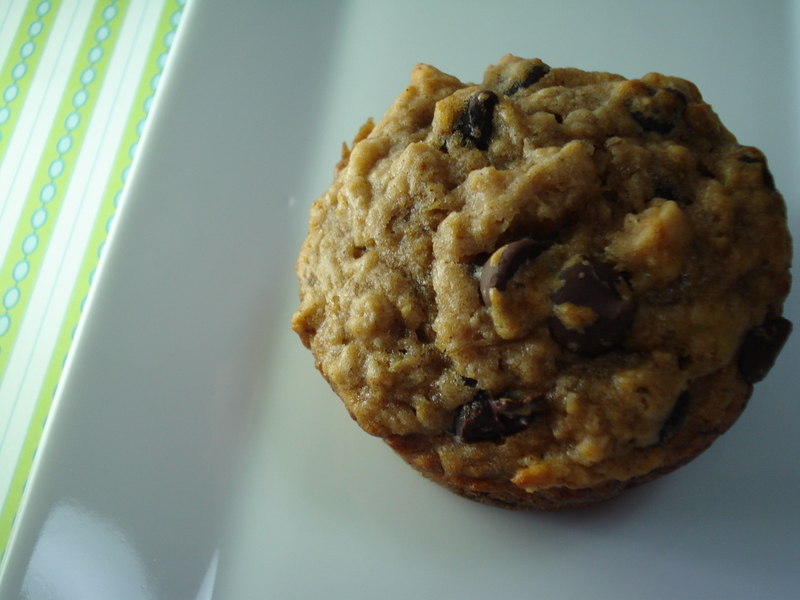 Which do you prefer: chocolate chips or fruit in your muffin? Combine rolled oats and choclate milk, set aside. In a large bowl, mix flour, sugar, salt, baking powder, baking soda, cinnamon and nutmeg. Add melted butter, eggs, vanilla and mashed bananas. Add wet mixture to dry ingredients and stir until just combined. Add in chocolate chips and gently stir. Fill muffin tins and bake for 20 minutes.